Nothing says Spring like asparagus (or a refrigerator filled with rainbow-colored hard-boiled eggs). So I was thrilled to find a hundred-year-old recipe that called for both asparagus and chopped hard-boiled eggs. The Scalloped Asparagus turned out wonderfully. 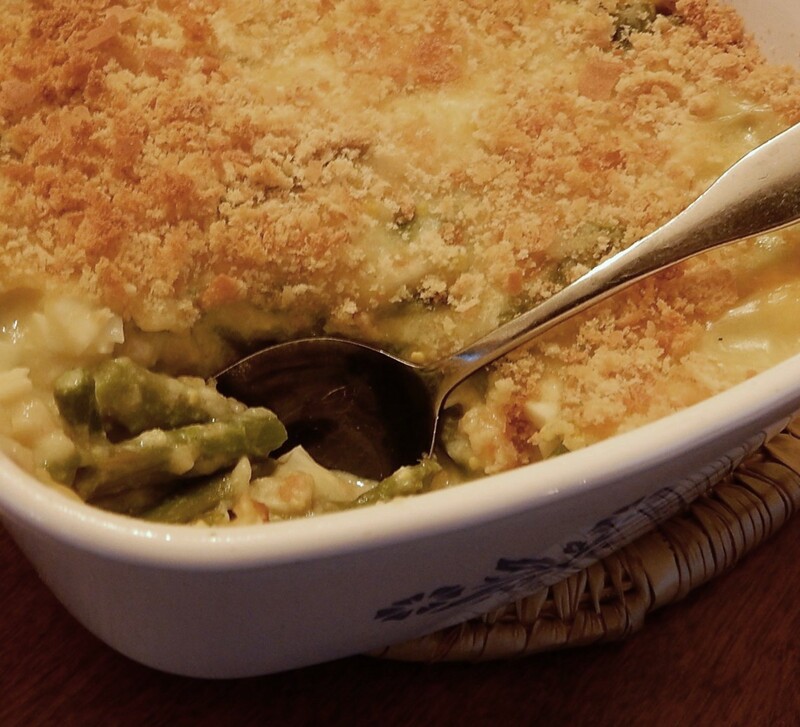 This classic dish was tasty, and made a lovely presentation with bits of asparagus and egg poking through the browned bread crumb and cheese topping. Preheat oven to 375° F. Boil or steam asparagus until tender (2-3 minutes). Meantime in another saucepan, melt butter. Stir the flour, salt, and pepper into the butter. While stirring constantly, slowly pour in milk and bring to a boil using medium heat. Remove the white sauce from heat. Put 1/3 of the cooked asparagus in a 1 1/2 quart casserole dish. Add a layer with 1/3 of the chopped eggs, a layer of white sauce, a layer of bread crumbs, and a layer of 2 tablespoons cheese; continue layering with the final two layers being bread crumbs and cheese. Bake for 1/2 hour or until the dish is hot and bubbly and the top is lightly browned. Remove from oven and serve. Posted on April 1, 2018 March 30, 2018 by SherylPosted in FoodTagged asparagus, recipe. I wish I liked asparagus . . . but if anything made it palatable, it would be eggs and cheese and milk! Happy Easter, Sheryl. If you don’t like asparagus, this is not the recipe for you. Happy Easter! We used to serve a creamed egg/asparagus combination over toast, or rice. This certainly would taste much like that, and what we had was quite good. I don’t know why we never scalloped the pair, but I’ll give it a try. The egg/asparagus combination sounds good. I’ve made several recipes over the years that sound somewhat similar to what you describe – but not exactly the same. The Creamed Asparagus on Toast recipe didn’t have any eggs, and the Egg Sauce recipe didn’t have any asparagus in it (though I served it over asparagus). That looks tasty! I’ll have to try it. Happy Easter! It should work just fine to halve this recipe. Recipes like this are very flexible. I love asparagus. Normally I roast it with a light coating of olive oil and a few spices, but this sounds like another great way to enjoy that vegetable in the spring. This is a very nice old-fashioned way of preparing asparagus. I think that you’d enjoy it. This is good! I’ve never made it but there’s a lady at church who brings this dish to church dinners. I always make sure I get some… it’s so good! One of the things that I like about potlucks and reunions is how certain people become known for their specialties, and how they generally bring those wonderful foods each time. It’s delicious. I think that you’d enjoy it.